Thick and soft Whoa, very nice aroma of something tropical, fudge and soft toffee. Thick and super soft mouthfeel. Very nice indeed! Sweet treat Awesome dessert! Soft, sweet (almost too sweet, actually...). Caramel, some vanilla, brown sugar. Love it! 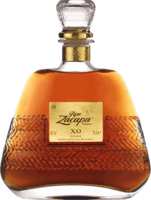 Smooth aroma, comes with a sting Surprisingly smooth and sweet on the nose, even comparing to Zacapa 23. Taste again is quite on par with the 23, not that spectacular. Tasty! Basic brown in color. Modeller's glue on nose. Strong, soft barrel taste, oaky. Some dried fruits in there Dark brown, mahogany. Soft but strong aroma, oak and barrel softnes. Dried fruits and light laquer. Thick mouthfeel, soft nuts, dried fruits. Notes of honey Smooth, fresh, a tad citrusy, notes of honey but not too sweet. Smooth anf fruity Berries and freshness on the nose. Smooth, strong and nice. Smooth bomb! Super intensive and big aroma, whoa! Sweet dark molasses, berries, juicy and oh so smooth. Bold and strong. Super smooth At Kaskis, Turku. Super smooth mouthfeel. Spicy aftertaste. Freshly cut pujo in aroma. Quite woody after a longer while! Not just raisins Compred to 5+5 this is more subtle on raisins, which is good. Dark fruits, brown syrup. Spicy! Interesting! Starts easy and soft but slowly develops into spiciness with distinctive liqourice. Juicy Juicy, nice berries, quite edgy. Oak on aftertone. Werther's Original in a bottle Lager colored. Aroma is vanilla, honey, fried banana, Werther's Original. Taste goes to heavy vanilla, banana, cream fudge. Syrupy! Sweet syrup on the nose, harder booze on taste. Could be sweeter, quite spicy! Smooth and hot Surprisingly smooth and easy going. Big and soft in mouth. Feels spicy and hot, but is not. Straight and raw Quite stingy, raw and straight. Spicy and a tad hot. Nice sipper, but not quite there Let it rest for a while and it blooms. Fruity, smooth and nice, but still not top of the line. Not as bad as I remembered There's some sweetness there, but it's topped with quite edgy alcoholic taste. Rubbing alcohol? Light straw colored, like white wine or cider. Light aroma, like an rubbing alcohol. Lightly sharp taste, a lot of alcohol. Use in a drink, maybe...? Basic basic Malty lager colored, thick on nose, quite smooth, yet boozy basic taste.